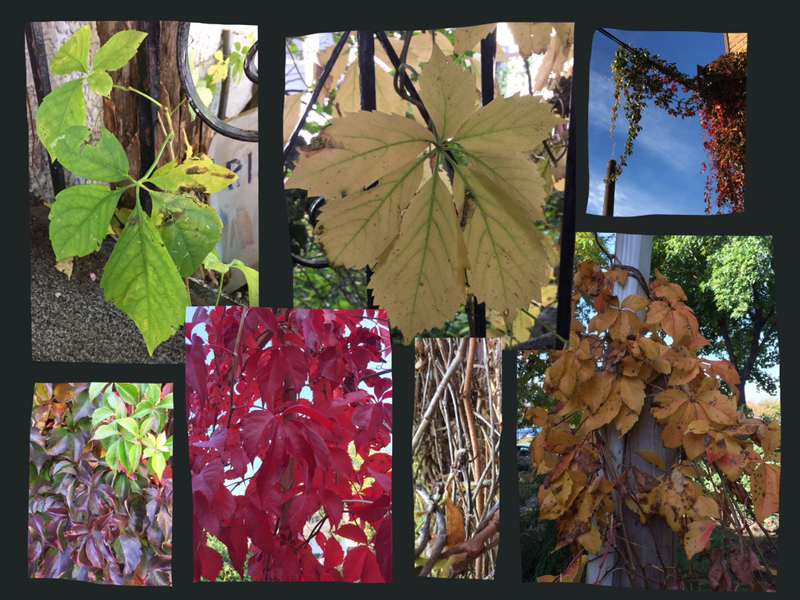 Fall colors have been amazing the past week in the Twin Cities area. Trees usually get most of the credit. But Virginia Creeper, a vine, is just as showy. And it shows up everywhere, maybe not always invited, and maybe not always noticed, but definitely part of the fall color show. 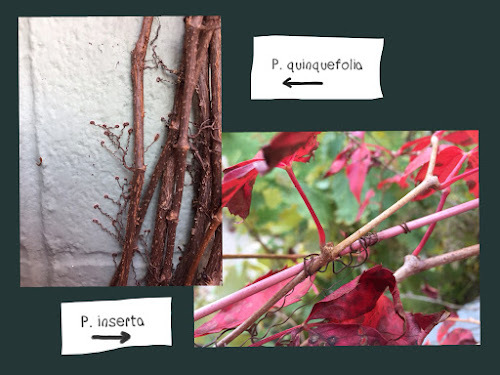 I'm not really sure how many people intentionally plant Virginia Creeper though it frequently climbs up buildings and other man-made structures. I have three patches in my yard that volunteered themselves over the years, one of them making a very attractive afternoon sun screen on our porch. The photos in this post were taken over two days and within a few blocks of one another. Almost every color is represented, even blue once you include the berries. Woodbine is another common name for the plant. This name is also used for other vines, especially an related honeysuckle found in Europe. Woodbine is also a brand of strong cigarettes. Sometimes it is called an ivy, but Virginia Creeper is not closely related to ivy (genus Hedera, in the ivy or ginseng family Araliaceaeis. 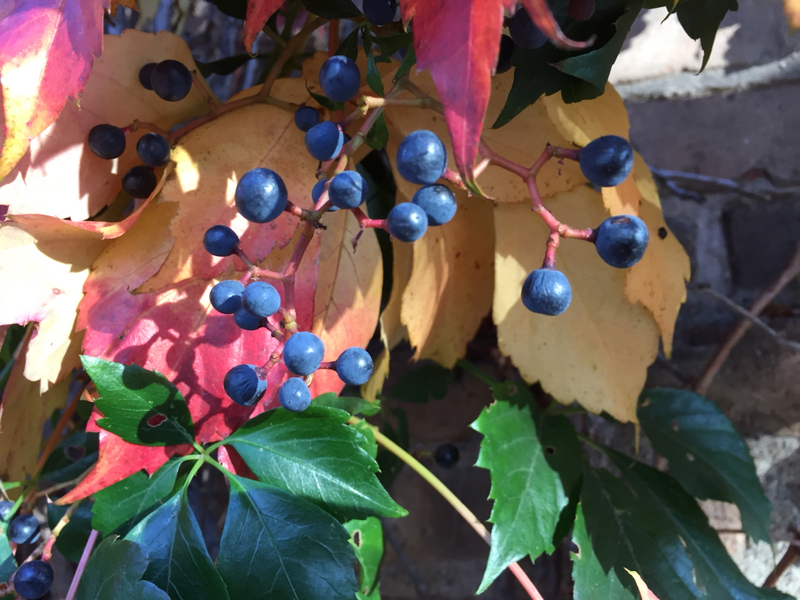 It is in the same family as grapes (Vitaceae), and can sometimes be found climbing over one another. They are actually two species of plants that go by the name Virginia Creeper, Parthenocissus quinquefolia and P. inserta. There are a number of subtle differences but the one I think is the most apparent is the type of tendrils each has. The tendrils of P. quinquefolia are many branched and end in small adhesive disks. The tendrils of P. inserta have fewer branches and no adhesive disks. It climbs by hanging on to small cracks and surface irregularities or by wrapping it's tendrils around objects with a small diameter such as twigs and stems; or heavy string if you want to make a Virginia Creeper screen. (Native Backyard Weeds is my phrase for native plants that aren't usually planted but often thrive when allowed to in a yard or other landscaped area).